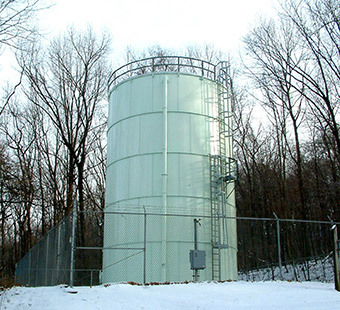 As the appointed Engineer for Lower Saucon Authority, Hanover Engineering assisted the Authority in a project to rehabilitate the interior and exterior surfaces of a municipal potable water storage tank located in Lower Saucon Township. Hanover Engineering provided professional services for all facets of the project, including initial structural inspection and condition assessment of the tank, and the specifications and bidding for contracting of the rehabilitation work. The project was bid in August 2003 and the tank was successfully returned to operation in November 2003. The Steel City Tank is a 165,000 gallon bolted steel standpipe originally designed by Hanover Engineering and installed in 1987. It provides fire protection storage and domestic demand buffer for a service area with approximately 227 customers. Hanover Engineering conducted an inspection in 2002 which revealed problems with the existing paint coatings and deterioration of structural supports for the tank’s roof. Hanover Engineering reviewed the findings with the Authority and developed project alternatives, including the final scope of work to rehabilitate the tank. All interior work met PA DEP Water Supply Manual requirements and NSF 61.